For other uses, see George Eastman (disambiguation). 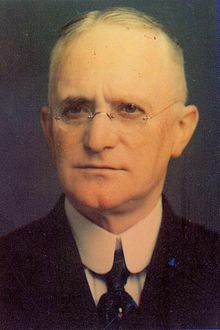 George Eastman (July 12, 1854 – March 14, 1932) was an American entrepreneur who founded the Eastman Kodak Company and popularized the use of roll film, helping to bring photography to the mainstream. Roll film was also the basis for the invention of motion picture film stock in 1888 by the world's first film-makers Eadweard Muybridge and Louis Le Prince, and a few years later by their followers Léon Bouly, William Kennedy Dickson, Thomas Edison, the Lumière Brothers, and Georges Méliès. He was a major philanthropist, establishing the Eastman School of Music, and schools of dentistry and medicine at the University of Rochester and in London Eastman Dental Hospital; contributing to the Rochester Institute of Technology (RIT) and the construction of several buildings at the second campus of Massachusetts Institute of Technology on the Charles River. In addition, he made major donations to Tuskegee University and Hampton University, historically black universities in the South. With interests in improving health, he provided funds for clinics in London and other European cities to serve low-income residents. In his final two years, Eastman was in intense pain caused by a disorder affecting his spine. On March 14, 1932, Eastman shot himself in the heart, leaving a note which read, "To my friends: my work is done. Why wait?" The George Eastman Museum has been designated a National Historic Landmark. 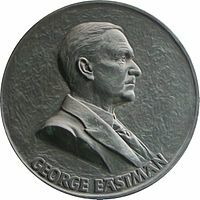 Eastman is the only person represented by two stars in the Hollywood Walk of Fame recognizing the same achievement, for his invention of roll film. Eastman was born in Waterville, New York as the youngest son of George Washington Eastman and Maria Eastman (née Kilbourn), at the 10-acre farm which his parents had bought in 1849. He had two older sisters, Ellen Maria and Katie. He was largely self-educated, although he attended a private school in Rochester after the age of eight. In the early 1840s his father had started a business school, the Eastman Commercial College in Rochester, New York. The city became one of the first "boomtowns" in the United States, based on rapid industrialization. As his father's health started deteriorating, the family gave up the farm and moved to Rochester in 1860. His father died of a brain disorder in May 1862. To survive and afford George's schooling, his mother took in boarders. The second daughter, Katie, had contracted polio when young and died in late 1870 when George was 15 years old. The young George left school early and started working to help support the family. As Eastman began to have success with his photography business, he vowed to repay his mother for the hardships she had endured in raising him. In 1884, Eastman patented the first film in roll form to prove practicable; he had been tinkering at home to develop it. In 1888, he perfected the Kodak Black camera, which was the first camera designed to use roll film. In 1889 he first offered film stock, and by 1896 became the leading supplier of film stock internationally. He incorporated his company under the name Eastman Kodak, in 1892. As film stock became standardized, Eastman continued to lead in innovations. Refinements in colored film stock continued after his death. In an era of growing trade union activities, Eastman sought to counter the union movement by devising worker benefit programs, including, in 1910, the establishment of a profit-sharing program for all employees. Considered to be a progressive leader for the times, Eastman promoted Florence McAnaney to be head of the personnel department. She was one of the first women to hold an executive position in a major U.S. company. George Eastman never married. He was close to his mother and to his sister and her family. He had a long platonic relationship with Josephine Dickman, a trained singer and the wife of business associate George Dickman, becoming especially close to her after the death of his mother, Maria Eastman, in 1907. He was also an avid traveler and had a passion for playing the piano. The loss of his mother, Maria, was particularly crushing to George. Almost pathologically concerned with decorum, he found himself unable for the first time to control his emotions in the presence of his friends. "When my mother died I cried all day," he explained later. "I could not have stopped to save my life." Due to his mother's reluctance to accept his gifts, George Eastman could never do enough for his mother during her lifetime. He continued to honor her after her death. On September 4, 1922, he opened the Eastman Theater in Rochester, which included a chamber-music hall, Kilbourn Theater, dedicated to his mother's memory. At the Eastman House he maintained a rose bush, using a cutting from her childhood home. Eastman was associated with the Kodak company in an administrative and a business executive capacity until his death; he contributed much to the development of its notable research facilities. In 1911 he founded the Eastman Trust and Savings Bank. He was one of the outstanding philanthropists of his time, donating more than $100 million to various projects in Rochester; Cambridge, Massachusetts; at two historically black colleges in the South and in several European cities. In 1918, he endowed the establishment of the Eastman School of Music at the University of Rochester, and in 1921 a school of medicine and dentistry there. In 1925 Eastman gave up his daily management of Kodak to become treasurer. He concentrated on philanthropic activities, to which he had already donated substantial sums. For example, he donated funds to establish the Eastman Dental Dispensary in 1916. He ranked slightly behind Andrew Carnegie, John D. Rockefeller, and a few others in his philanthropy, but did not seek publicity for his activities. He concentrated on institution-building and causes that could help people's health. From 1926 until his death, Eastman also donated $22,050 per year to the American Eugenics Society, a popular cause among many of the upper class when there were concerns about immigration and "race mixing." Eastman donated £200,000 in 1926 to fund a dental clinic in London, UK after being approached by the Chairman of the Royal Free Hospital, George Riddell, 1st Baron Riddell. Donations of £50,000 each had been made by Lord Riddell and the Royal Free honorary treasurer. On November 20, 1931, the UCL Eastman Dental Institute opened in a ceremony attended by Neville Chamberlain, then Minister of Health, and the American Ambassador to the UK. The clinic was incorporated into the Royal Free Hospital and was committed to providing dental care for disadvantaged children from central London. It is now a part of University College London. Eastman also funded Eastmaninstitutet, a dental care clinic for children opened in 1937 in Stockholm, Sweden. Memorial at Kodak Park in Rochester. Eastman's ashes lie beneath the Georgia marble monument. In his final two years, Eastman was in intense pain caused by a disorder affecting his spine. He had trouble standing, and his walk became a slow shuffle. Today, it might be diagnosed as a form of degenerative disease such as disc herniations from trauma or age causing either painful nerve root compressions, or perhaps a type of lumbar spinal stenosis, a narrowing of the spinal canal caused by calcification in the vertebrae. Since his mother suffered the final two years of her life in a wheelchair, she also may have had a spine condition but that is uncertain. Only her uterine cancer and successful surgery are documented in her health history. Eastman suffered from depression due to his pain, reduced ability to function, and also since he had witnessed his mother's suffering from pain. On March 14, 1932, Eastman died by suicide with a single gunshot through the heart. His suicide note read, "To my friends, my work is done – Why wait? GE." Raymond Granger, an insurance salesman in Rochester, was visiting to collect insurance payments from several members of the staff. He arrived at the scene to find the workforce in a dither. At least one chronicler said that fear of senility or other debilitating diseases of old age was a contributing factor. His funeral was held at St. Paul's Episcopal Church in Rochester; his coffin was carried out to Charles Gounod's "Marche Romaine" and buried in the grounds of the company he founded, at what is now known as Eastman Business Park. Eastman had a very astute business sense. He focused his company on making film when competition heated up in the camera industry. By providing quality and affordable film to every camera manufacturer, Kodak managed to turn its competitors into de facto business partners. In 1915, Eastman founded a bureau of municipal research in Rochester "to get things done for the community" and to serve as an "independent, non-partisan agency for keeping citizens informed." Called the Center for Governmental Research, the agency continues to carry out that mission. During his lifetime Eastman donated $100 million to various organizations, with most of his money going to the University of Rochester and to the Massachusetts Institute of Technology to build their programs and facilities (under the alias "Mr. Smith"). He was one of the major philanthropists in the United States during his lifetime. The Rochester Institute of Technology has a building dedicated to Eastman, in recognition of his support and substantial donations. MIT installed a plaque of Eastman on one of the buildings he funded. (Students rub the nose of Eastman's image on the plaque for good luck.) Eastman also made substantial gifts to the Tuskegee Institute and the Hampton Institute in Alabama and Virginia, respectively. Security Trust Company of Rochester was the executor of Eastman's estate. His entire estate was bequeathed to the University of Rochester. The Eastman Quadrangle of the River Campus of the University of Rochester was named for him. Eastman's boyhood home was saved from destruction. It was restored to its state during his childhood and is displayed at the Genesee Country Village and Museum. U.S. Patent 226,503 "Method and Apparatus for Coating Plates", filed September 1879, issued April 1880. U.S. Patent 306,470 "Photographic Film", filed May 10, 1884, issued October 14, 1884. U.S. Patent 306,594 "Photographic Film", filed March 7, 1884, issued October 14, 1884. U.S. Patent 317,049 (with William H. Walker) "Roll Holder for Photographic Films", filed August 1884, issued May 1885. 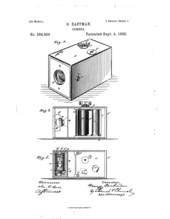 U.S. Patent 388,850 "Camera", filed March 1888, issued September 1888. Eastman licensed, then purchased U.S. Patent 248,179 "Photographic Apparatus" (roll film holder), filed June 21, 1881, issued October 11, 1881 to David H. Houston. In 1930 he was awarded the American Institute of Chemists Gold Medal. In 1934, the George Eastman Monument at Kodak Park (now Eastman Business Park) was unveiled. 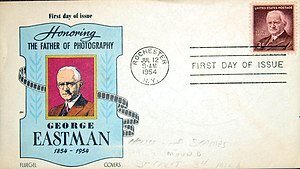 On July 12, 1954, the U.S. Post Office issued a three-cent commemorative stamp marking the 100th anniversary of George Eastman's birth, which was first issued in Rochester, New York. Also in 1954, to commemorate Eastman's 100th birthday, the University of Rochester erected a meridian marker near the center of Eastman Quadrangle on the campus of the University of Rochester using a gift from Eastman's former associate and University alumnus Charles F. Hutchison. In the fall of 2009, a statue of Eastman was erected approximately 60 feet (18 m) north by northeast of the meridian marker on the Eastman Quadrangle of the University of Rochester. In 1966, the George Eastman House was designated a National Historic Landmark. The auditorium at the Dave C. Swalm School of Chemical Engineering at Mississippi State University is named for Eastman, in recognition of his inspiration to Swalm. An often-repeated urban legend recounts that photographer and musician Linda McCartney (née Eastman, first wife of Beatle Sir Paul McCartney) was related to the George Eastman family, but this is not true. Her father was of Russian Jewish ancestry and changed his surname to Eastman before becoming known as an attorney. At least one biographical film has been made about George Eastman. It was an independent production made in the 1940s, apparently never preserved and mostly lost to time titled either The Life of George Eastman or George Eastman: Some Scenes Form His Life. The film, aired on television for a time into the 1960s, ends with his development of all-color negative film. In 1981, the short film The Lengthened Shadow of a Man about Eastman was made, the title of which comes from the T. S. Eliot poem 3. Sweeney Erect. ^ a b Lindsay, David "George Eastman: The Final Shot". American Experience. PBS. Retrieved August 30, 2013. ^ McNellis, David (September 10, 2010). Reflections on Big Spring: A History of Pittsford, NY, and the Genesee River Valley. AuthorHouse. p. 147. ^ a b c "Maria Eastman article". American Experience. PBS. Retrieved August 5, 2012. ^ a b "George Eastman." Gale Encyclopedia of U.S. Economic History. Edited by Thomas Carson and Mary Bonk. Farmington Hills, Mich.: Gale, 1999. Retrieved via Biography in Context database, January 26, 2018. ^ Ford, Carin T. (2004). George Eastman: The Kodak Camera Man. Enslow Publishers, INC.
^ Spiro, Jonathan (December 15, 2009). Defending the Master Race: Conservation, Eugenics, and the Legacy of Madison Grant. UPNE. p. 353. ISBN 9781584658108. ^ Black, Nick. Walking London's Medical History. ^ QUIGLEY, KATHLEEN (March 18, 1990). "Splendor Restored At Eastman House". The New York Times. ^ "George Eastman". www.riversidecemeteryjournal.com. Retrieved March 23, 2018. ^ "About CGR". Center for Governmental Research Inc. (CGR). Retrieved September 1, 2011. ^ Morrell, Alan (January 7, 2017). "Whatever Happened To ... Security Trust?". Democrat and Chronicle. ^ "After 40 years, two collections of George Eastman's papers reunite at the George Eastman Museum". George Eastman Museum. January 31, 2017. ^ "University of Rochester: Campuses and Landmarks". University of Rochester. ^ "Genesee Country Village and Museum". Genesee Country Village. 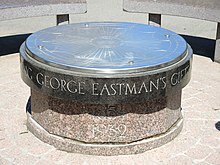 ^ "Eastman monument a reminder of what was, what could be". Democrat and Chronicle. Rochester, New York. April 2, 2014. p. 1B. Retrieved July 4, 2017. ^ "George Eastman Issue". Smithsonian National Postal Museum. Retrieved July 3, 2014. ^ "Hutchison (Charles F.) Collection". rbscp.lib.rochester.edu. Rochester, New York: University of Rochester. Retrieved July 4, 2017. ^ Skanse, Richard (April 20, 1998). "Linda McCartney Dies at 56". Rolling Stone. ^ "3. Sweeney Erect. T.S. Eliot. 1920. Poems". www.bartleby.com. Retrieved February 1, 2019. Brayer, Elizabeth (1996). George Eastman: A Biography. Baltimore: Johns Hopkins University Press. ISBN 0801852633. Wikimedia Commons has media related to George Eastman. Wikisource has the text of a 1922 Encyclopædia Britannica article about George Eastman.